Saturday Night (Is Alright for Poker)! Many years ago, Elton John sung a rocking song about boozy Saturday nights out concluding in a few rounds of fisticuffs on the pavement. In those dim and distant days with pen in hand and creative juices flowing, it is unlikely that a game of cards costing £320 to enter came into lyricist Bernie Taupin's thoughts. Thirty years and more on, a Saturday night is certainly alright for poker. Such was the case at the Brighton Grosvenor Casino overlooking a steely, restless English Channel last weekend. The writer and his UK Poker News colleague, Paul Sandells, the latter also playing the tournament, took a trip down to savour the atmosphere and the tables at the venue of the Brighton Festival of Poker 2006, Main Event, the £300 (+ £20) No Limit Texas Hold'em Freezeout. We arrived at the Grosvenor by late afternoon; the casino was quietly ticking over awaiting the anticipated influx of poker players. Meanwhile, a few Saturday afternoon early birds were testing their luck at the blackjack and roulette tables. First impressions were that this is a pleasant casino, roomy yet intimate. After a swift refresher of beer and sandwiches, the latter supplied on the house, it was time to have a chat with a few of the important players in the forthcoming event. By important, we mean the production team behind and around the scenes, without whom there would be no top quality tournament in which to play! Initial enquiries with the card room staff showed 45 early entries. Ten tables of ten seats apiece were in position for the anticipated field approaching 100 players. Elliot, the card room manager informed us that this was the Brighton Grosvenor's first poker festival, so anticipation was high, nerves were taut and fingers crossed for a successful conclusion. One of the dealing staff, Laura, was also carrying the burden of keeping things running. A busy night lay ahead for her. The first sign of life came in the form of a lady sporting a very expensive looking camera. This was Andrea, a freelance photographer sent down to the casino on behalf of the Brighton Argus newspaper. It soon became clear that she was here for an hour-long 7 o'clock assignment, and would then attend another client's birthday party at 8.30. Unfortunately, she had not been told that the poker tournament wasn't slated to start until 8pm and most likely would not start on time even then. Such is life as a freelancer! This gave us a chance to chat, answer some of Andrea's questions on poker and learn a little about top-end digital cameras. Paul also had his photo taken as an official "poker player". Andrea eventually snapped some "proper" action photos at the poker tables before dashing off at some point before 9pm. Intriguingly, Andrea was asked not to take photos of one particular gentleman who informed her that his wife hadn't the first idea he was playing poker for £300 a go on his Saturday night out! Once the tournament got underway, the supervisor told the writer that several experienced Grosvenor dealers were in evidence from other casinos in the chain, including Luton, Southampton and Swansea. He was confident of a trouble-free evening given the pedigree of the dealers. Meanwhile, another lady was busy going through and reconciling the entry slips, cash receipts and so on. The final entry details concluded that 93 players started the tournament. A brief skip through the player list identified a few names that have enjoyed success in 2005, including Paul Parker, Kevin O'Leary, Ian Frazer, Robbie Debeaulox and Dave Welch. This tournament coincided with the rather bigger Birmingham Open, the £1,000 Main Event at the Broadway Casino, Birmingham so the Grosvenor at Brighton will certainly have lost a few participants to that attraction. The early action on view saw some spectacular exits. Two of the first to go took "AA" bad beat stories away with them, both the victim of players making 2-pair with moderate hole cards. The best early clash saw some good manoeuvring by a player who flopped a four-of-a-kind and persuaded his opponent to bet off all of his chips. Play continued into the night and the final table was concluded the following day. Local player, Mick Clark, a man with a solid and consistent record at this size of tournament, took the spoils and £9,600, an amount certainly worth fighting over on a Saturday night - as well as Sunday afternoon - at the tables. 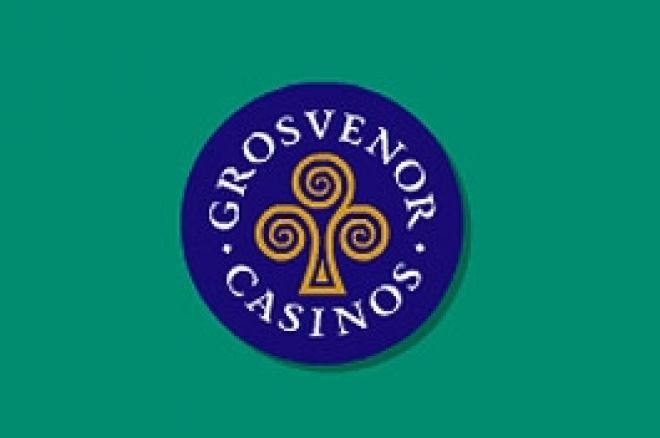 UK Poker News would like to extend it's thanks to the Brighton Grosvenor card room staff, and casino manager John Riley, for allowing access to the "engine room" during the tournament.